There’s a reason that Acura is renowned for its technology offerings, and the TLX is no exception to the rule. The 2017 Acura TLX includes a variety of advanced features that come standard on every model, as well as a long list of upgrades available when you opt for the Technology Package. But even with the base model, you’ll have a variety of sophisticated features to play with. Get a quick run-through of the tech you can expect from the TLX, then make your way to Acura of Denville to see this midsize luxury sedan for yourself! Even the base 2017 TLX gets quite a few exciting tech features, and you’ll take notice of the amenities before you step inside the vehicle thanks to the Keyless Access system. All you need to do is touch the door handle when the keys are in your pocket. Once you’re settled in, you can make and answer calls with Bluetooth® HandsFreeLink®, as well as use Siri® Eyes Free to stay connected to your apps without taking your eyes off the road. You’ll also get safety tech like the Tire Fill Assist system and a Multi-View Rear Camera with guidelines. If you opt for the technology package, your TLX will come decked out with the latest high-tech gear. Enjoy the likes of an ELS Studio® Premium Audio System, which lowers distortion and enhances the clarity of sound. 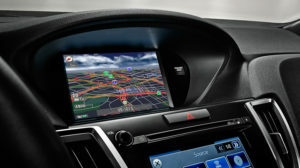 The added Intuitive Navigation system is projected on the 8-inch LED screen and utilizes the Voice Recognition System, so finding any destination will be a breeze. You can even avoid busy routes with AcuraLink Real-Time Traffic™ with advanced Traffic Rerouting. Other highlights are the Lane Keeping Assist System, GPS-Linked Climate Control, HD Radio®, and Rain-Sensing Windshield Wipers. Take a Closer Look at the Advanced Features of the TLX at Acura of Denville! If you want your next vehicle to be jam-packed with the latest technology, then it’s time to consider the 2017 Acura TLX. You can take it for a test drive today by visiting Acura of Denville at 3109 Rt. 10 East in Denville, NJ. If you’d like to learn more about the technology of the TLX before stopping by or want to set up an appointment, feel free to contact us! We look forward to finding the right Acura model for you.